Whether it's a tiny Chihuahua or a large Labrador, they are welcome with us. We have always had dogs around from pups to oldies and always aim to offer the best of care and attention. 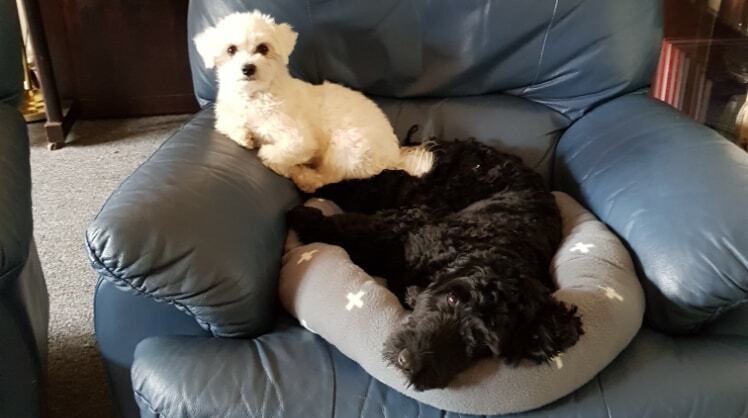 We have trained working dogs and bred Spaniels, Spoodles and Maltese giving us an understanding of dog-care from the newborn through the teenager to the sleeps-a-lot. As a home based painter of custom cards, we have lots of time to spend with our canine visitors and although our house is small we have fantastic walks on our doorstep to take advantage of. We walk at least twice and can do more or less depending on the needs of the dog. Our aim is to make your pets stay with us happy, safe and well balanced. We understand the importance of following your routine with your pet and are capable of giving medications if required. Having recently returned from our own small holding in Australia, we are also good with reptiles (including snakes), spiders and parrots! We have looked after a range of farm stock - cattle, alpaca, sheep etc and I am an ex horse woman. We take a pride in caring for peoples pets and, when house sitting, their properties. We have stacks of references from all our animal care and are happy to share them. Dog sitting, walking and boarding. Cat and small fluffies sitting and boarding. House and pet sitting.Collection and drop off available upon request for a small additional charge.